Even with regular microwave oven maintenance, the smell of burned popcorn can last for months. Frustratingly, the smell often gets worse each time you use your microwave again. Old, unpleasant odors can permeate the flavor of other foods you cook. Burned popcorn or leftover salmon does no favors for freshly cooked green peas or your bedtime mug of warm milk. 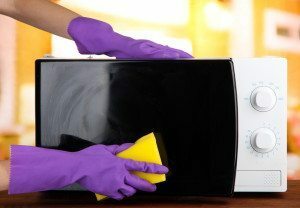 Following is an overview of some typical microwave odors and some simple, practical steps that can help you bring a normal scent back to your microwave. Why Does My Microwave Smell So Bad? When you overcook food in your microwave, the plastic interior walls absorb the burned smell, and it’s not just limited to popcorn. Anything that burns will leave an aroma you can do without, ranging from pizza to salmon and pork ribs. The microwave cooking space is small, the heat is intense during cooking and the smell has nowhere to go. Smoke and vapor can infiltrate deep into the walls as well as into cracks, nooks and crannies. The smell will eventually dissipate, but it can take months, in some cases. You can help speed up the process yourself, using products you have around the house. Before you deal with the odor, it’s important to clean the microwave thoroughly. It is much easier to get rid of odors when the inside of your microwave is free of spatters and food debris, which can also hold in odor. Start by cleaning the tray or carousel in soapy water. Next, wash the walls with a mild, nonabrasive cleaning solution. Fill a microwave-safe measuring cup or cereal bowl about half full with water. Add a dash of dishwashing liquid and put it in the microwave. Heat the soapy solution on high for about a minute, watching carefully to ensure it doesn’t start to bubble. Once the water begins to steam, remove the container, then wipe the interior with a damp sponge. Most of the gunk and spatter should come off quite easily. Repeat this process if grime continues to stick. The cleaning gurus at Good Housekeeping recommend using lemons to get rid of microwave smells. Cut up three or four fresh lemons and add them to one-and-a-half cups of water in a microwave-safe bowl. Heat this mixture until it boils, then allow it to sit inside the oven for about 15 minutes, or until the bowl is cool enough to handle safely. Prop the oven door open for an hour or so to allow it to air out. Out of lemons? Try vinegar. Add one-quarter cup to the water instead of the lemons, then follow the same procedure. Of course, you can always use the old standby, baking soda. Use the same method, but substitute two tablespoons baking soda for the lemons or vinegar. If the smell still lingers, try a 50-50 solution of vinegar and water. Bring it to a boil and let it stand for an hour. One of these methods should work to get rid of the burned or pungent smell. You may need to repeat the process more than once. After dissipating the worst of the smells, you might still have lingering, faint odors. This is caused by the odors creeping into the inner workings of the microwave. The final step should replace this persistent smell with one that is easier on the nose. Get out your bowl again. Add an aromatic spice like cloves or a cinnamon stick to one or two cups of water. Get it boiling in the microwave and let it stand until the bowl is cool, at least 15 minutes. The steam this generates will filter into the cavities of your microwave’s interior, replacing the lingering burned smell with a much more pleasant odor. These steps, added to your microwave maintenance routine, should get rid of the unwanted aroma of burned food. 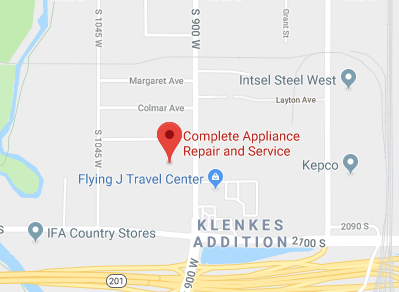 If your best efforts fail to remove the offending odors, contact Complete Appliance Repair in Salt Lake City. They can help you purge the smell from you microwave oven with maintenance and repair service. This entry was posted in Blog and tagged DIY Appliance Maintenance, Microwave Maintenance, Microwave Oven Maintenance on July 7, 2015 by admin.